When the history books are finally written documenting America’s failed experiment with broadcast industry content regulation, this past week may go down as a critical moment in the story. The obvious reason this week was so important was the Senate’s 87-11 vote on Thursday to prevent the Federal Communications Commission (FCC) from reinstating the Fairness Doctrine. But an equally important development this past week was the release of a new white paper by the radical Leftist activist group Free Press. 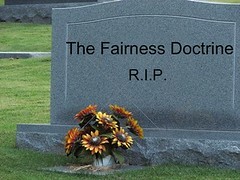 The Fairness Doctrine, while originally well-intentioned, is not wise public policy. [T]he Doctrine places the FCC in charge of determining what is fair in political speech — a difficult task in the best of circumstances. Placing the government in the role of monitoring and judging political speech will inevitably produce controversy that is impossible to resolve. I applaud the Free Press for finally fessing up to the Fairness Doctrine’s many failings. This First Amendment-violating abomination should have never been allowed to be enforced by the FCC to begin with, but at least we can now all finally agree it should stay off the books for good. Of course, the radicals at the (Un)Free Press weren’t about to let one of the Left’s old favorite regulations go so away without asking for something in return. One of the reasons that Silver and Ammori are suddenly willing to give their blessing to the Doctrine’s burial is because they want to get on with the more far-reaching agenda of micro-managing media markets using a variety of less visible regulations. Indeed, in their paper, Silver and Ammori go to great pains to try to show that the Fairness Doctrine supposedly has nothing to do with all the other regulations that they want Congress and the FCC to continue to enforce, or even expand. These goals include media ownership restrictions, diversity mandates, local programming regulation, and so on. Recognizing that the Fairness Doctrine was not only ineffective but also a useful tool for many on the political Right to whip their base into action, the Free Press moved to preemptively divorce their other pet projects from the Fairness Doctrine. There’s a rich mythology that has built up around “the public interest” efforts of the progressives, but like the Fairness Doctrine, it’s all just arbitrary government abuse of the First Amendment at the end of the day. Indeed, as I’ve noted here before, the public interest standard is not really a “standard” at all since it has no fixed meaning. The definition of the phrase has shifted with the political winds to suit the whims of those in power at any given time. As such, it represents an utter betrayal of the First Amendment and the rule of law. And all the regulations that are pursued in the name of “serving the public interest” are really nothing more than crass political thuggery that have no relationship to what the public actually wants to see or hear. The “public interest” should be what the public says it is, not a handful of unelected bureaucrats who want to spoon feed us nonsense we don’t want and then censor that stuff we actually desire. The folks at the Free Press can tell us that there is no linkage between the Fairness Doctrine and all these other regulations, but that doesn’t make it so. At the end of the day, these regulations share many things in common, especially their hopelessly arbitrary, First Amendment-betraying nature. Thus, the war for true media freedom will continue. Nonetheless, it is important not to lose sight of the important win this week for that cause with both Congress and the Free Press acknowledging the anti-free speech, diversity-destroying nature of the UnFairness Doctrine.